This is a Statement Ring for those that love to stand out of the crowd...something that is a bit out of the ordinary, yet organic and seems as if one with your hand. 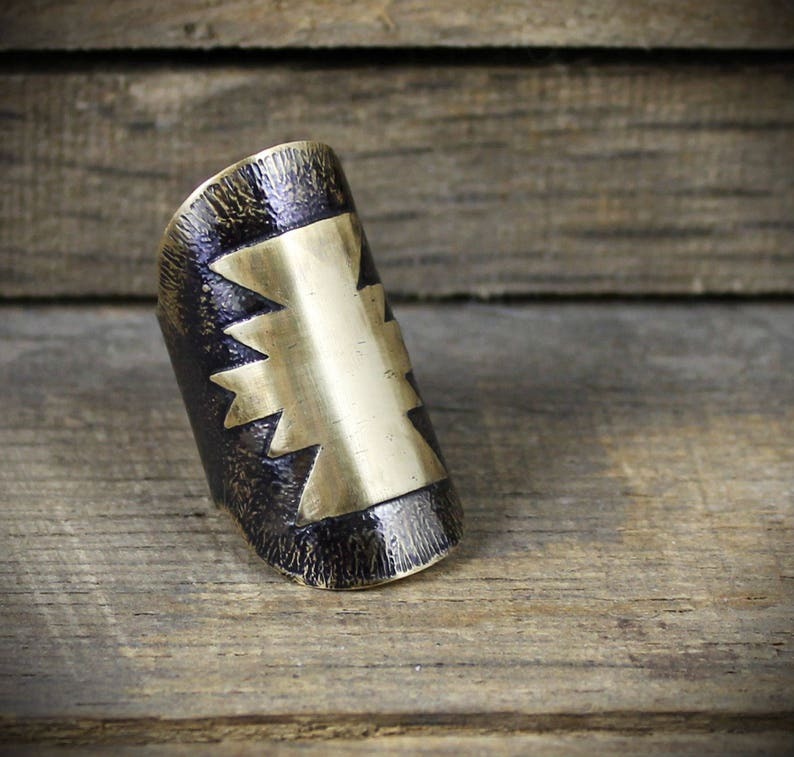 A large hand pierced and formed brass ring, with a hand drawn and etched Navajo inspired shape on the exterior, has a nice weight to it, yet is extremely comfortable to wear. The interior that bears my makers mark E², is hammered and sanded smooth for a comfortable feel against your skin. The organic and rustic textures are a lovely side-effect of the etching process, and lends a ancient feel to the ring. 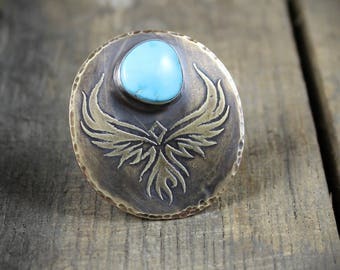 This ring would perfectly compliment some sterling and turquoise jewelry! The ring was oxidized for color and effect, given some "battle scars", then treated with a polished wax protectant finish that sinks deep into the metal to preserve the rich color for years to come. Over time, the patina will deepen and become even more beautiful. It is intended to look slightly aged and worn from the beginning, I've created it so it has that timeless look. Dimensions - 1.50" long and approx .90" wide depending on the size of finger it is shaped for. The ring shank is .70" wide. This piece is MADE TO ORDER with lots of love!!! Please see my main shop announcement for current fabrication times. The manner in which this ring is created, with a small gap in the back, lends itself to being very easy to switch fingers if you so desire. 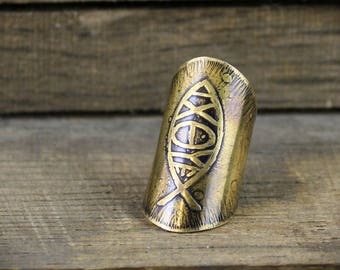 The brass has a bit of give to it, and can be gently squeezed to make a smaller ring, or gently pulled apart to fit a larger finger, within a size or two each way. When you include your ring size, I will form the ring to fit that size, but be aware that you may need to adjust slightly to fit once you have received it. This piece ships Priority Mail with delivery confirmation and free insurance for the United States, and 1st Class Mail with included insurance for Everywhere Else! If you should require a different shipping method, please contact me prior to purchasing to discuss available options. AWESOME RING. THANK YOU. LOVE IT. I had this whole thing planned in my head to write out but honestly and simply put, you won't regret getting something from this seller. Pretty late review but I had to say... I love this ring so much! It's the coolest one that I have. I wear this every day. Such a sturdy and well-made piece and matches every look that I am wearing. I love it so much, amazing customer service as always! I currently accept Paypal, which includes all major credit cards, (convo me about paying with a check or money order!). When paying with your credit card simply proceed using the Paypal link during the checkout process to complete your payment (Paypal processes payments and keeps your information safe and confidential, and you DO NOT need an existing Paypal account to use this feature). For custom work, I require a 50% non-refundable deposit. For those purchasing within the state of Texas, you will automatically be charged 8.25% State Sales tax when you checkout through paypal. EstherEveMetalsmith is not responsible for paying additional VAT charges for International orders. Your country may require you to pay taxes or other fees. Please check import tax and regulation within your country before buying. I want you to be completely satisfied with your new jewelry, absolutely love the work, and become filled with joy every time that you wear it! If there is ever a problem with your piece due to my workmanship, I will gladly discuss a possible repair. My work is created with old-world metalsmithing techniques that are designed to last for a lifetime. If I fabricate a ring with the size you provided and you are not happy with the fit, this is your responsibility, but I am very happy to accept an exchange for shop credit, or resize the ring for an additional $30 fee (minus all shipping costs). If you have any questions regarding ring sizing prior to placing an order, please contact me and I can direct you to an online ring sizing chart, or ship a small ring sizer directly to you. For returns on custom orders that may involve stamping of dates or initials, please contact me so that we can come to an agreement that will make you happy! If for any other reason you are not completely satisfied on initial receipt of your piece, please contact me within 7 days to initiate a refund (minus all shipping costs). All returns must be postmarked within 14 days of initial receipt. I would recommend that returns should be insured for your protection, as well as a delivery confirmation. Please contact me first so that we can discuss the return, refund, and shipping arrangements. Ready made pieces will be shipped within 2 business days of purchase! Please be sure that the addresses in both your Paypal and Etsy accounts match! If they do not match, I will inquire as to which address to send to, and this may create a delay in shipping. Orders over $50.00 are shipped using USPS Priority Mail with delivery confirmation and included insurance for $7.00. For all orders under $50.00, they are shipped 1st Class Mail for $4.00. All orders are shipped using 1st Class International Mail for $11.00. If you would prefer a more expedited shipping (or insurance or tracking number), please send me a convo prior to your purchase, and I can add the shipping to your listing. Customs forms on international shipments are completed with factual information including actual value of the item being shipped. This is for my protection and yours. International buyers are responsible for any and/or all customs fees, taxes, and duties associated with their purchase and shipping to the buyer's country, should they be assessed. Any fees, taxes, tariffs, duties, etc. that may be incurred at the time of delivery would be at the discretion of your country's tax regulations. I have no way of determining these fees and I cannot be responsible for any of these charges. International shipments can take 1 to 6 weeks for arrival. I have no control over how long a package stays in customs. If you need expedited International shipping, please contact me prior to ordering. I am available for wholesale or consignment requests, so please contact me with requests or questions!